Transporting boxes full of paperwork to your nearest shredding facility can be time-consuming and difficult. It can end up being a costly process if you factor in time lost during loading, unloading, and driving out to a Detroit facility. Mobile shredding offers the perfect solution. Shred Nations Detroit will send a truck to your location to shred your documents onsite. Shredding your confidential documents is necessary to keep you, your family, and your employees safe. There are also federal and state laws to comply with that mandate the proper destruction of sensitive information. Shred Nations Detroit makes it easy to shred all of your documents in no time. Mobile trucks come to you and make sure your family and business are safe from identity theft. The first step is to fill out the form on the right or call us at (313) 528-3009. We will connect you to local shredding companies nearest you in Detroit, and in just a few minutes have several quotes for your shredding project. Choose the company that provides the service that best fits your budget and project needs and they will provide you with locked shredding bins. Once you fill up the bins with documents to shred, the company will drive out to your Detroit location in a shredding truck, and shred everything on-site while you watch. When the job is complete, you are handed a certificate of destruction, verifying the proper destruction of your documents. Throughout the entire process, none of the employees ever come in contact with your paperwork. Is Mobile Shredding Secure in Detroit? Keeping your private information private is the entire goal of shredding your paperwork. So is it worth it to take any chances when using a third party shredding company? 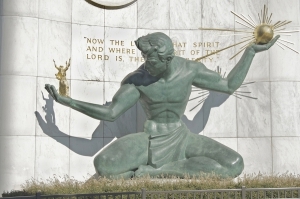 Shred Nations Detroit effectively eliminates the risk associated with using a middleman. Your documents are placed in locked shredding bins, so nothing is misplaced and no employees come into direct contact with your files. Plus, a certificate of destruction is issued for each shredding job, ensuring that the process was completed in accordance with all federal and Michigan laws—including HIPAA and FACTA. How Much Does Onsite Shredding Cost in Detroit? On average it costs around $100 in Detroit to have a truck come to your location and shred your documents on-site, however depending on location or any special requests it could cost a little more. If you are thinking of dropping off your documents, those services typically cost $0.25 per pound. A standard box of paper weighs around 30 pounds, so if you have less than 10-12 boxes of paper you might consider our dropoff service. But if you have more than 10-12 boxes, or if you are looking for a more convenient way to shred, onsite services can save you time and hassle. And remember that the closer you are to your shredding company, the cheaper the onsite services will be. For free quotes on a Mobile Shredding Service for your sensitive documents in Detroit give us a call at (313) 528-3009 or fill out the form to the right. We offer secure mobile document shredding services throughout Detroit and Eastern Michigan. When businesses compete for your project, you win. Our normal business hours are Monday-Friday from 8 AM to 3 PM.